Creamy triple mushroom beer soup on the craft beering menu today. As promised sharing the recipe for Chris’ delicious creation in which the earthy flavors of shiitakes, baby bellas and white button mushrooms come together with the rich, malty character and toasty edge of Doppelbock. Why choose Doppelbock to make this soup? Few other beers can deliver the same intensity of flavor to accompany a mushroom trio as Doppelbock. The strongest of the bock lagers, it is quite full bodied with a syrupy mouthfeel. Doppelbock has a very particular dark fruitiness to it (reminiscent of figs, prunes, ripe grapes/raisins) and a faint caramelized sugar presence. The unobtrusive use of Noble hops balances the sweetness and imparts a hint of herbal notes but no bitterness. Notes of toasted bread and biscuit round off the dominant flavor profile earning the style a food friendly reputation. We had a few Paulaner Doppelbock bottles at home and Chris used one of them to construct the broth for the creamy triple mushroom beer soup. Paulaner Brewery is in Munich, Germany, one of the six breweries permitted to brew Oktoberfestbier and serve it during Oktoberfest. Chris makes his Doppelbock beer soup with shiitake, baby Bella and white button mushrooms. A robust backdrop to the merits of the lager, further bettered by the involvement of butter, onions, double cream and a lot of thyme. The cleaned baby Bella and white button mushrooms can be cut into pieced in their entirety. The stems of the shiitakes must be removed and not used as they are extremely dense and become unpleasantly chewy. They could however be used for a home made mushroom broth/base to be added in the soup in lieu of the chicken stock Chris normally uses. If you are interested in creating homemade broths, we recommend this book. If you’d prefer a very intense, almost smoky mushroom flavor, you could soak a few small pieces of dried shiitake in hot water until fully reconstituted and then dice them really small. Their pungent nutty flavor also results in a sense of meatiness when they get added to dishes. Dried porcini mushrooms can work too, even though they will impart a less intense flavor than dried shiitakes. Chris garnishes the soup with fresh thyme and freshly ground pepper. A small bowl is all you really need to serve – it is so deeply satisfying. If you will be making the soup as the first course to a meal, be sure to have it followed by a meaty, hearty dish with loads of flavor. Something that will at least match its robustness, not pale in comparison with it. Personally, I like to obtain satisfaction with a larger portion of the soup, then finish my meal with simple toasted bread and a strong, pungent and moldy cheese or a few slices of aged gouda or Camembert. And a small glass of Doppelbock. It is a delectable combination and makes for a complete dinner. 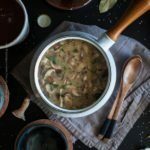 If you like the handmade Japanese wooden spoons in the pictures (they really add a rustic touch to the experience of enjoying this soup) you can find them here. 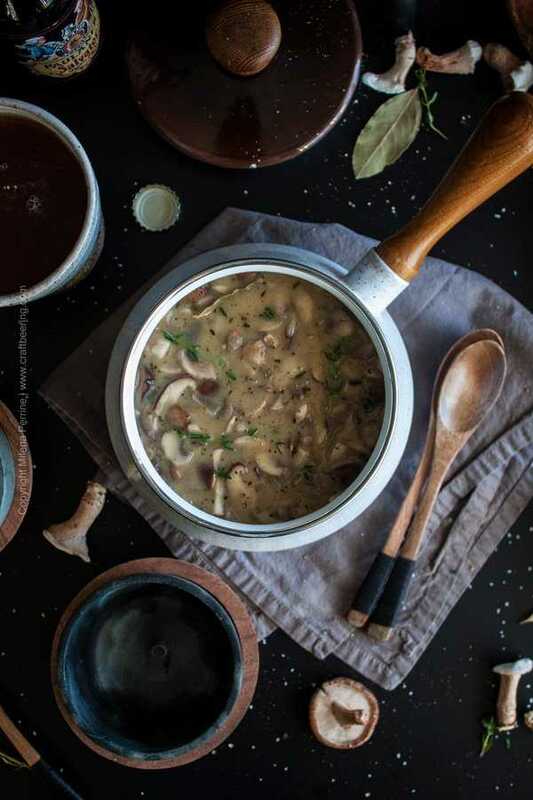 Besides this beer soup, a recipe where Doppelbock and mushrooms have a remarkable interaction resulting in immense pleasure for the taste buds is our Chicken Beersala. You have got to try it! It is one of our most popular cooking with beer recipes along with the Schweinshaxe. This post contains affiliate links which help support our blog without any cost to you. Earthy, malty, creamy deliciousness meant to be eaten when the weather is cold and the nights are long and dark. 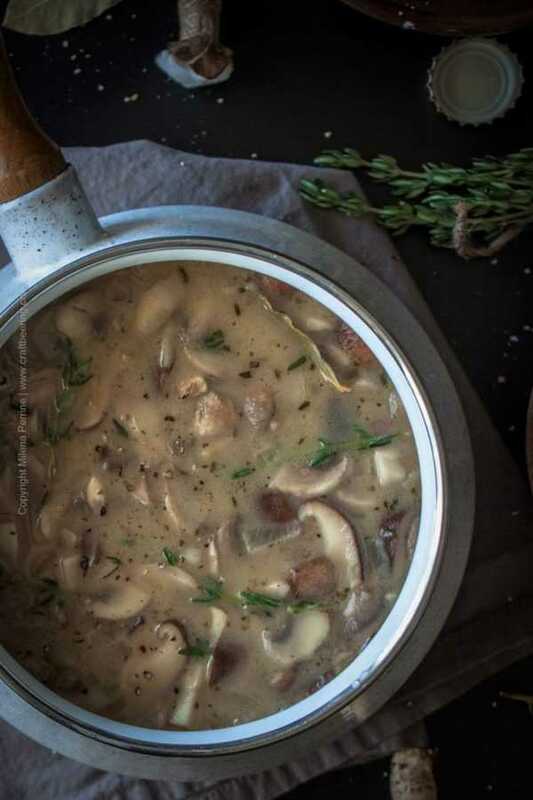 Doppelbock lager adds magic to this thyme infused creamy triple mushroom beer soup. Clean and slice the mushrooms. You can use the stems of the white button and baby Bella, but do discard those of the shiitakes as they are tough and very chewy. In a heavy bottomed pot over medium heat melt the butter and sweat the diced onion until translucent. Add the mushrooms, salt and pepper and about 1 1/2 tbsp of thyme leaves (gently torn off the stalks). Stir and let them cook, add the 2 tbsp extra butter at this stage. Once the mushrooms begin to release liquid, add the flour and gently stir until it is incorporated. Slowly begin to pour the Doppelbock as you continue to stir gently. Bring to simmer and let simmer for 4-5 mins for most of the alcohol to evaporate. Add the chicken stock slowly as you stir and bring to simmer again. Let simmer for 10-15 minutes, partially covered with a lid. Add the cream, stir to incorporate and turn of the heat. Serve immediately garnished with fresh thyme or transfer to a soup tureen to keep warm. This soup is delicious! I couldn’t find dopel bock in our small town, but I was told that bock beer tastes very similar. It turned out really, really delicious. Thank you, Elizabeth. Bock lager works too, even though typically not as sweet and strong as Doppelbock. Thank you for taking the time to comment! This looks amazing! Thank you for sharing. Yey! Thank you so much, Kathryn! Thank you so much, Rita! I was looking for a good soup recipe and I’ve finally found one of the best recipes. Perfect combo of some nutrient-dense ingredients. What kind of flour do you use for this soup? I’m so into mushrooms at the moment so this sounds perfect! The beautiful pictures portray a sense of warmth, coziness, and comfort. The soup looks and sounds amazingly tasty with the beer, the butter, and cream. 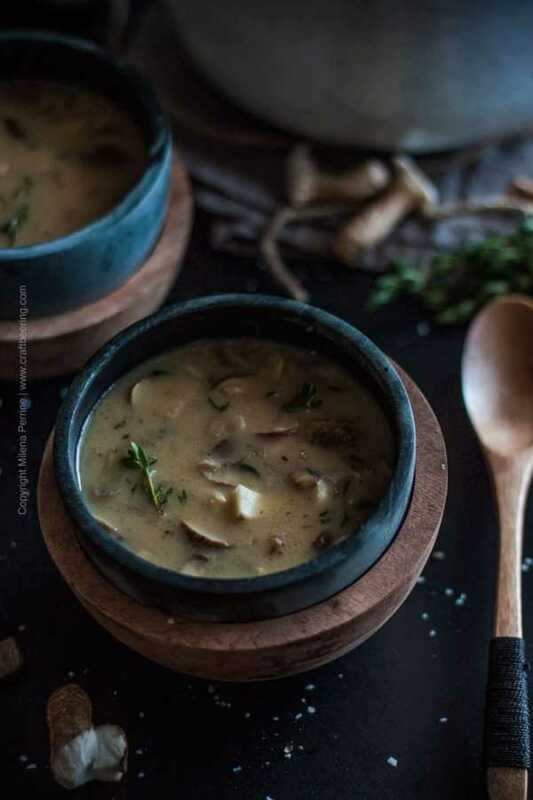 We love a good mushroom soup and this is just perfect. Those bowls are so pretty, not only for ice cream 😉 . 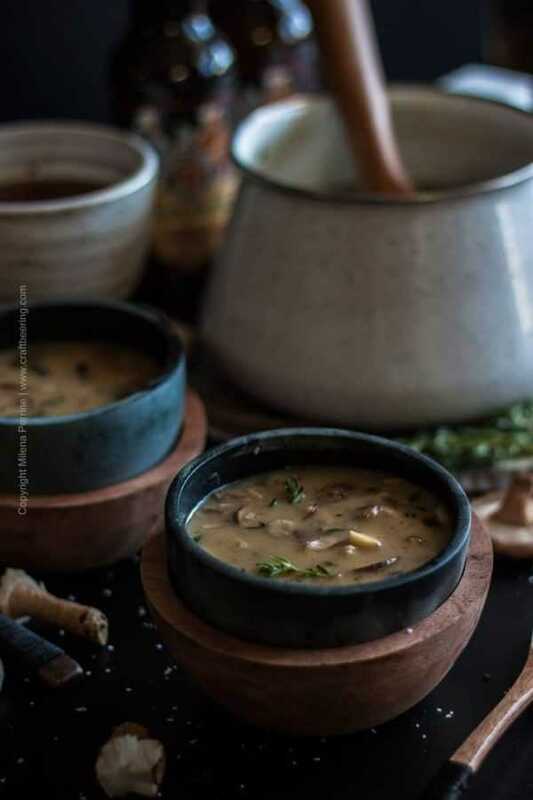 Mushroom soup is one of my favorites and your version has me all sorts of excited! The ultimate in cozy right here! Your Mushroom Beer Soup will be amazing! Happy to see you here at Full Plate Thursday and thanks so much for sharing with us. Thank you Miz Helen, always a pleasure! I’m not a mushroom fan, but my husband and oldest both LOVE them. This will definitely have to get put on the menu soon. Thanks so much for sharing at the #happynowlinkup! Our son neither, more for us:) Thank you, Leslie! What a gorgeous looking soup! The perfect antidote to all this cold weather! 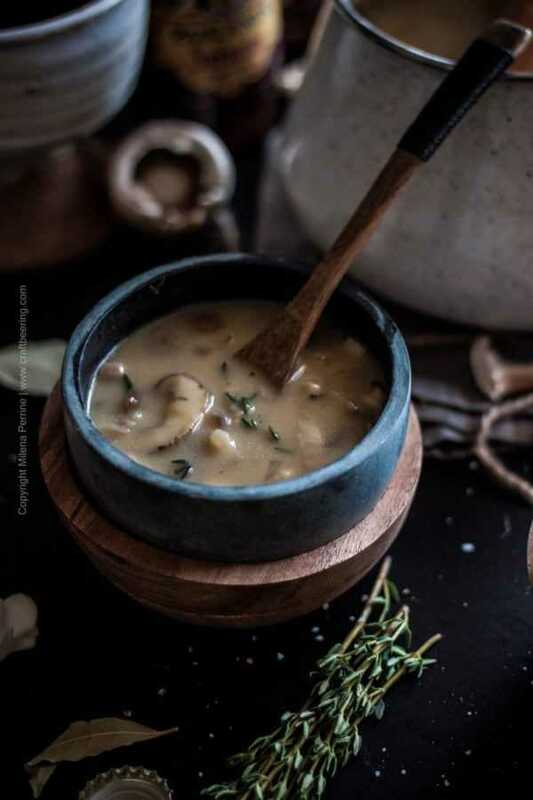 I absolutely LOVE mushroom soup! I’ve used cream in it before, but not beer so I bet this is absolutely divine!! Those bowls are absolutely gorgeous too!! My dish collection is definitely growing, but I would love to add these. This would be so perfect today, especially since it is super cold and winter is definitely here. Cheers to a great week!